Have you ever pondered a popular quote from a popular author? Ever read something and thought Wow! That’s just too good not to share? Thanks to the miracles of modern technology, now anyone can share a special quote with everyone. Of course, just because you find interesting or poignant, that doesn’t mean others will, right? Well, what if lots of people find the same quote interesting? 1) It wasn’t that it had been too long without a girl. It was that it’d been a lifetime without the right one. 2) Lex: Every night after practice he eats at Asian Fusion. Gross. You’ll find General Tso at his usual spot. 1) Just because sandcastles are temporary, it never stopped me from making them as beautiful as possible. 1) Let the sandcastle collapse. In its place, I will build a fortress—one that the waves of nature and time could never destroy. 2) I might have underestimated my father, but he had no idea how much he had just underestimated me. 1) The rules of the Hunger Games are simple. In punishment for the uprising, each of the twelve districts must provide one girl and one boy, called tributes, to participate. The twenty-four tributes will be imprisoned in a vast outdoor arena that could hold anything from a burning desert to a frozen wasteland. Over a period of several weeks, the competitors must fight to the death. The last tribute standing wins. 1) I know an excuse when I hear one. Don’t you dare deceive yourself into believing that you’re the victim, Derek Novak. 2) eighteen-year-old Sofia Claremont made five-hundred-year-old me feel like a boy. 1) we hold our fate in our hands. We always have a choice. Don’t settle for less than the future that you dream of with her. 2) You are who you choose to be. No matter how much light is shed upon you, if you still choose to remain in darkness, that’s your doing, not anyone else’s. 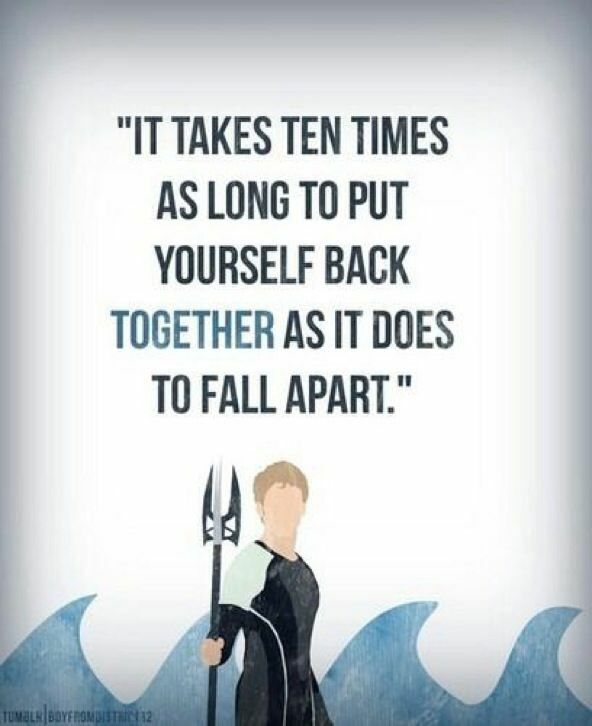 1) It takes ten times as long to put yourself back together as it does to fall apart. 2) And it takes too much energy to stay angry with someone who cries so much. 1) You’re no stranger to storms. The waves may rage, but you can rise above them. 2) All of the bad and good things that come with living become worthwhile once we find love. 1) Because sometimes things happen to people and they’re not equipped to deal with them. 2) Life in District 12 isn’t really so different from life in the arena. At some point, you have to stop running and turn around and face whoever wants you dead. 1) I was left to ponder over the power of a simple apology. A taming of one’s ego, an admission of being fallible… the effect that these things could have on a relationship was profound. I couldn’t help but feel that if more people were ready to apologize in the world, it would be a brighter, happier place. 2) Those ghouls really should charge for their service. Ghoul rehab. Guaranteed results for the assholes in your family. 1) A friend does not abandon a friend during troubled times. That is when the friendship is needed most. 2) I have learned, mostly through painful experience, never to be dismissive of a friend’s accusation, even if it seems unreasonable. More often than not, it is well-meant, the truth, and something I have needed to hear but did not want to. It is an easy thing to be offended. It is difficult to learn something new about ourselves. 1) If more of us valued food and cheer and song above hoarded gold, it would be a merrier world. 1) The wide world is all about you: you can fence yourselves in, but you cannot for ever fence it out. 2) I don’t know half of you half as well as I should like; and I like less than half of you half as well as you deserve.